Ryobane ( 両バネ ) literally means double hane (but is not used for a Two Step Hane). It is a combination of two hane. 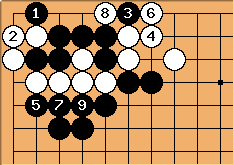 The ryobane of and gives the Black stones an extra liberty, so that Black wins the race to capture. This is an example of the proverb, Ryobane gains one liberty. This example comes from http://www2.tokai.or.jp/tuta/yose.html . is tesuji. 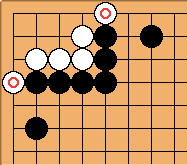 Without the exchange, - , Black could play at . This example comes from http://igotyuugakusya.hp.infoseek.co.jp/11isinosikatu5.htm . The combination of and is a ryobane. This is an example of the proverb, Eight lives. This example comes from http://www.h-eba.com/heba/JITEN/jiten1-5.html. 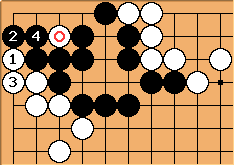 Even with the ryobane White is dead.